Yesterday we discussed a four-year trend in new customers. 2017 vs. 2013 results = -16%. What's interesting, of course, is how this relates to the average price of an item at Gliebers Dresses. 2017 vs. 2013 Results = +11%. This is one of the vexing challenges of modern cataloging and (more importantly) modern e-commerce. It has become harder and harder to find new customers. To compensate, CFOs have encouraged Merchants to bump up the price of new items. New customers find the prices offensive. Marketing is consequently blamed (not their fault), so they tack on 30% off plus free shipping. Customer file is poisoned by discounts/promotions. Roger actually says something insightful up there, doesn't he? 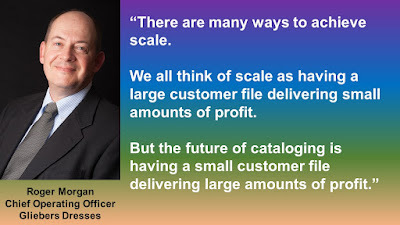 "The future of cataloging is having a small customer file delivering large amounts of profit." 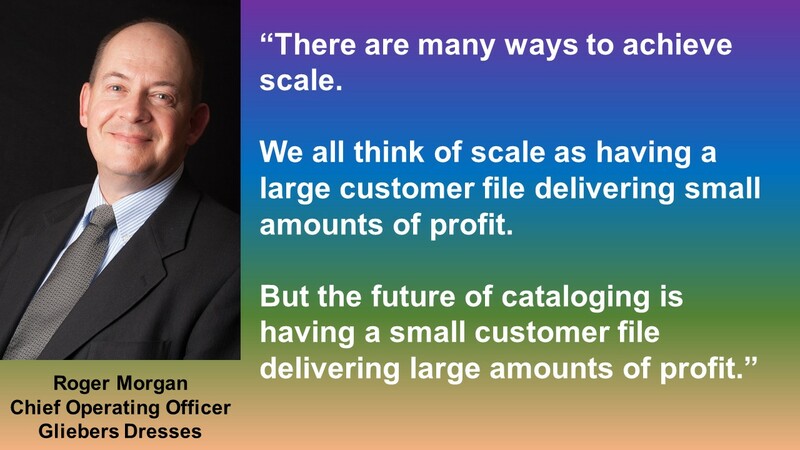 He (surprisingly) can see the future ... a smaller business with a hyper-loyal (but tiny) customer base. I want you to think about what all has to happen to move a business in this direction over the next five years ... and I want you to think about decisions+consequences. In the past few years, many folks have raised prices on new items, creating a negative feedback loop. Use your imagination to consider the consequences of this decision. And together, we'll discuss this issue at the VT/NH Group event on April 5 (click here to register). Why don't you join me on 4/5?